Modern power supply and distribution system, the inverter and the rectifier equipment used in great quantities, make injection harmonic content also increased, in the grid has a harmful effect on power supply equipment, load the frequent start, quickly and accurately compensation for reactive power compensation equipment and harmonic filter proposed new requirements. Traditional low-voltage dynamic reactive power compensation filter unit TSF filter group, although the dynamic grouping but due to the limited the number of clusters, a single set of compensation capacity is larger, the compensation curve is not smooth, and TSF passive filter device can filter out certain number of harmonics, filtering effect are greatly influenced by the power grid impedance variations. And although APF active filter has good filtering function of load harmonic current and reactive power compensation system, and can be compensated for 2 ~ 62 times harmonic spectrum, filtering effect is not affected by the grid frequency change, but the cost is too high. The device is widely used in electric power, steel, coal, railway, petroleum, machinery, chemical, shipbuilding, automobile, port, light industry, building materials, mining and other load power factor is low and the need for dynamic reactive power compensation and harmonic control industry. Because the system operation process not only has impact on power grid, but also generate harmonic current, great harm to the power grid. So you need to rapidly and exactly for reactive power compensation and harmonic management. While SERUSVG low-voltage dynamic reactive power supply is designed according to these load. 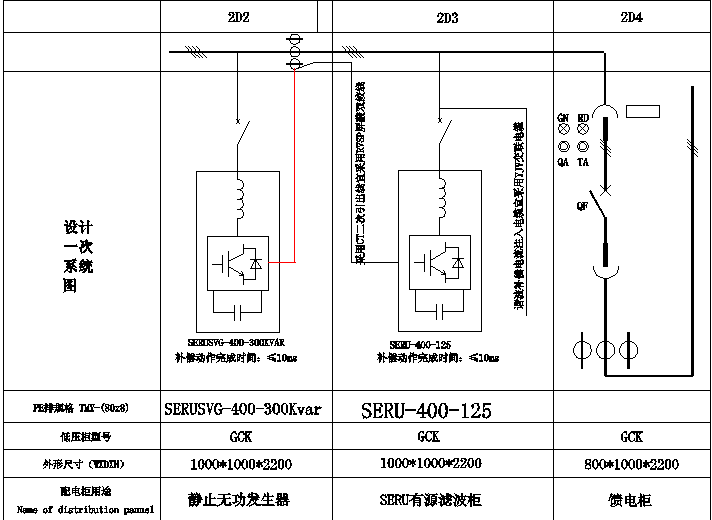 By real-time detecting load current waveform, detect the harmonic and reactive component, is used to control SERUSVG low-voltage dynamic reactive power operation. Through the control of thyristor and IGBT, make the output load the required capacity of reactive power and harmonic filter, filter out (offset) to realize harmonic, dynamic compensating system reactive power and voltage fluctuation, suppress harmonic and improve power factor, and other functions, so as to improve the power system security, the purpose of saving energy and reducing consumption. At breakneck speed to achieve the bidirectional dynamic reactive power compensation and phase splitting, make the power factor to predetermined value easily. Quick response, at the same time of reactive power compensation can effectively solve the power quality problems such as voltage fluctuation and flicker. Greatly improve the reactive power compensation capacity and compensation accuracy. 0.98 or higher, energy-saving effect is remarkable.